The benefits of teaching our children about music appreciation are numerous. Music represents all things good and beautiful in the world. Music can connect us to other people. Music is universal and crosses both generational and language barriers. Children enjoying music can bring so much happiness to older generations because of the way kids have fun with music. It can bring joy and comfort to those who are hurting and can help us to express emotions when we don’t know how otherwise. Music gives kids brain power. When you pair learning facts like multiplication tables, history paragraphs, scriptures, etc., to music, you enhance a child’s ability to retain the information. Music can greatly increase spatial awareness and mathematical and scientific reasoning. Also, playing classical music while studying or learning can increase retention and concentration. Learning to play a musical instrument is hard. It takes a lot of work, and while it requires a lot of focus, it also builds focus. Learning a musical instrument builds discipline as well as patience. Listening to music and sitting to play require one to sit for an extended amount of time. This is not a practice that many are accustomed to today while so many things demand our attention and are constantly distracting us. I think everyone can relate to hearing a song that perfectly says what you’re feeling. Children can experience this as well. Music can help with emotions if you need to calm a child, help them focus or help create energy. Music can be both calming and playful. Give a kid a set of drums and watch how they express themselves in emotional highs and lows. I took piano classes briefly as a child. I was intimidated by the teacher and basically didn’t want to work hard to learn something new and challenging. I was used to things coming easily, and learning how to read music and play an instrument is definitely not easy. As unfortunate as my experience was, it taught me an important lesson when it comes to my own kids. I want my kids to experience all of the amazing benefits of music, so we start lessons young and we encourage them to take part in musical activities just like we do with sports. 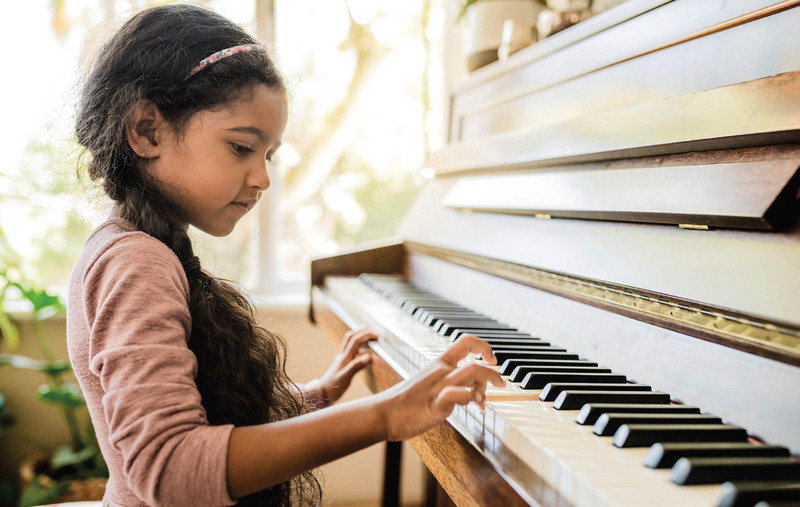 Don’t worry if your child doesn’t become the next Mozart. The benefits of focused attention, strengthened brain power, creativity, confidence boosting, discipline and an effective form of expression are all worth the process.